At RM19.90 per kg, I was like, WOW!!! So cheap, huh? Ended up, I had crab almost every night at one of the restaurant in SS2 for the past few weeks. But, I love Butter Crab more! Extremely yummy!!! So, what is your favorite crab dish? Or you are not crazy for crab at all? It's 7a.m. now and I'm craving for crab! What a crap! I love crab!!! 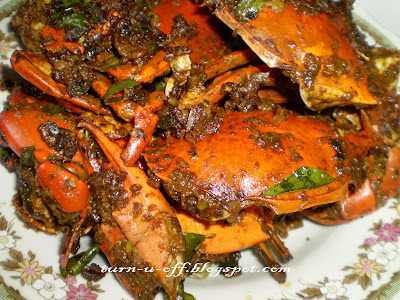 There's this restaurant called hai peng on old klang road that serves the best crab! Their source is to die for! Fantastic! I miss it so so much! i just got into crabs last month, delicious. I absolutely adore crabs! And it's good to have "man tao" to dip into the sauce. Yummy!! oh yes, I love Fatty Crab! "man tao" dip into the butter crab sauce, oh god! YUMMY!!! Enjoy your weekend too my dear..
yes dear, hope to see "wishing on a falling star" in my Top EC list!!! Not sure about that, but their specialty is the spicy sweet and sour source. YUM! Wow!!! U really know how to eat huh:) Yummy.yummy...I also feel like eating now after looking at your delicious crab crab...hee..